Because man is a simulacrum of the universe (made in the image and likeness of God), all archetypal powers that exist in the universe also reside embryonically within man. Deep initiatory magic is about contacting the intelligences of those archetypes on the universal level to mediate that power back to connect, integrate with, and unfold the embryonic levels of the archetypes within the psyche, thereby forging permanent connections. The magic circle is a composite symbol of man’s place in creation, but also the symbol of his perfection when he completely integrates the intelligences that complete his wholeness. The simple act of creating a magic circle properly is a microcosm of the entirety of the true magical work as a whole. Humans are born with the inherent capacity to become transfigured when specific evolutionary forces are activated. Knowledge of these evolutionary processes has long been the domain and purpose of the Western Mystery Tradition, whose function was to instruct initiates in specific processes where one comes to ‘Know Thyself’—in the fullness of what it means to be human, and paths of work that facilitate reaching the pinnacle of human capacity. In this Way, it is the function of initiation within the Western Mysteries to facilitate reaching and stabilizing continuously deeper levels of spiritual illumination and consciousness… levels that ancient sages and adepts experienced and recorded for posterity. This is the deepest purpose and meaning of magic. In the initiatory stage of magical training, work is done to achieve direct communion with specific archetypal intelligences whose function is to bring about accelerated evolution, through direct and purifying interaction via specific inner work, until reaching full illumination and being capable of exteriorizing those fabled powers that such permanent union bestows. Power, for the magus, is achieved by knowing and mediating the potencies of archetypal intelligences that exist on an universal level and, if working ceremonially, by creating composite analogs (tools) that have been indwelt by those intelligences (that correspond to the symbolism of the analog) to facilitate the mediation of their potencies for participation in advanced magical workings. In the study of magic, “As above, so below” is an axiom of the Hermetic Arts that concisely expounds an universal truth that has incredible depth, but also has an often overlooked and deeper meaning… “As within, so without”. This is the doorway that the Seeker is truly seeking. “As within, so without” leads to a deeper magical reality that one eventually comes to directly experience (through gnosis) as a holographic reality. Once the pattern or holographic nature of reality is accepted, a more useful view of “As above, so below” becomes accessible pertaining to the levels of reality, the laws of Nature, and the underlying mechanics of existence: A paradigm wherein one sees the parallels of the macrocosm (universe) in any microcosm, as underlying principles from the world of causes that are expressed in the world of effects. The world of effects is the level of existence most call consensus reality, or the material world. For those that only experience this level, to whom only the exterior of things, the husk of the kernel, is visible or tangible, their perception remains concretized, which keeps them trapped in that level of experience at a fixed density. For the magus, who stands in a circle, for the circle to be truly useful it needs to be understood how a symbol can be magically effective in a world of ‘solid’ matter. The answer is that we are not in a world of solid matter, we are in a world of living symbols that have assumed solid appearance as they have descended into deeper levels of the creative matrix. Therefore, we are dwelling in a symbolic world, even though in the beginning of magical praxis it may not yet be experienced as such. Within the causal worlds symbols are living aggregations of powers that are themselves reflections of the organizing intelligences that they represent in a way that supercedes any written, temporal language, and are thus a true universal language. 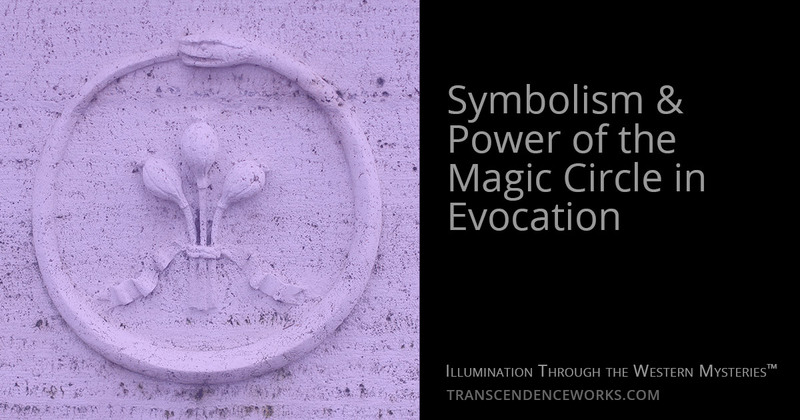 Proper use of this universal language allows the magus to configure or reconfigure permutations of symbols in the causative world that thereby precipitate changes in the world of effects according to the level of exteriorization powers achieved by the magus. This is the reason why magic is refuted by those who fail to experience anything, or realize that real magic is not the mere recitation of an incantation, which in the hands of a layperson is just empty words. Yet, in the hands of a magus who has forged a personal connection to each universal symbol and thereby accessed and integrated with the intelligence and power of the symbol, who is thus able to mediate it through the true universal language… well, that is an entirely different matter! Pun intended. The very first symbol the magus learns is the circle. He stands within the circle that is to become the perimeter of a microcosm forged from a merging of his intention with intelligences evoked and invoked to seal his working space in accordance with universal law. The circle is a perimeter that has been extended from one point. That one point, holographically speaking, is the same point that is all points and is essentially the center of everything. So from the center of everything a perimeter is expanded that is perfectly equidistant at every point along its perimeter from its center. It is thus a symbol of perfection that conveys to all other symbols and intelligences its inherent perfection, thus highest in the order of things. The circle, once created, is then sealed by intelligences called by the magus for this purpose, each extending the powers under its domain to seal the space effectively. Although this process is used in many magical traditions it is generally not fully understood as to exactly why… and exactly why is something that separates a true magus from the majority of his magical cousins. Binding the circle, if done properly, is a process of mediating the living symbol to create an hermetically sealed sphere… giving an additional dimension that not only defines the circumference, but also the above and the below. This is brought about by the natures of the intelligences summoned, and the inherent nature of their place within the hierarchy of beings. This process, performed by mediating intelligences of the four elemental energies comprising creation, is the evocation segment that seals the below and the invocation of the other hierarchal intelligences seals the above portion and completes the seal of the sphere at the circumference where the above and below meet… also figuratively giving the placement of man in the hierarchy of intelligences as man is in the center of the above and below. At the adept stage of initiatory magic, once the magus builds the circle within himself fully (on a much deeper level than is conveyed here), he no longer needs the exterior symbol because he becomes a living version of the symbol itself. Seekers interested in deep magic training in the Western Mysteries paths may wish to explore private training options as they are available.